SVED™ Wound Treatment System is a Negative Pressure Wound Therapy (NPWT) is a portable suction device that is AC-powered with battery backup for up to 18 hours that provides localized negative pressure. 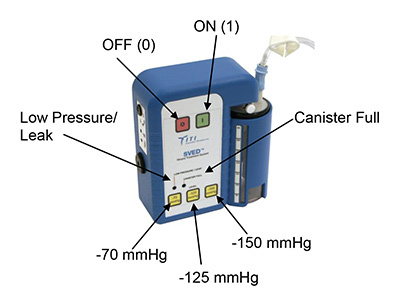 This device is indicated for patients who would benefit from vacuum assisted wound closure and continuous irrigation of a wound site by controlled delivery of topical wound treatment solutions* over the wound bed. The SVED™ is designed for use with ITI's proprietary black and white polyurethane foam dressings, canister and adhesive polyurethane drapes. This device is designed for use with continuous irrigation to a wound with sterile saline or other applicable topical solutions. Negative pressure can be applied to assist in the removal of infectious materials and other fluids prior to, during and after irrigation. 1. 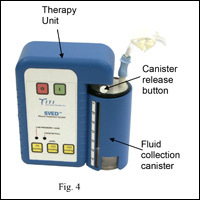 Ensure that an ITI Fluid Collection Canister is properly inserted in the receptacle located on the side of the therapy unit (see Fig 4). The Canister should “snap” into place and lock. The canister release button may need to be depressed to permit canister insertion. NOTE: Always use a new canister with a new patient. 2. Inspect the adhesive tubing flanges to ensure that they are properly connected to the ITI Foam Dressing (a) and that the connections are well sealed. 3. 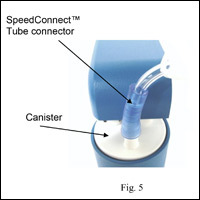 Connect the distal end of the SpeedConnect™ Tube with the blue tapered connector to the Patient port of the Canister (see Figure 5). Gently twist and push the connector on just enough to secure and seal it. Also, make sure that the clamp on the SpeedConnect™ Tube is open (see Figure 6). 4. Plug the therapy unit’s A.C. Adapter into a suitable 120 VAC, 60 Hz, 3-prong outlet. 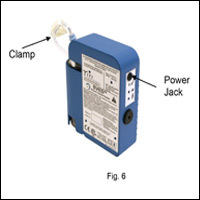 Insert the power plug into the Power Jack on the side of the Therapy Unit (see Figure 6). 5. Verify the dressing application is correct, the tubing is connected, the Dressing Suction Tube clamp is open and the Dressing Irrigation Tube clamp is closed. 1. The ON and OFF buttons are located on the front top of the control panel. The ON and OFF buttons control the application of power to the therapy unit. 2. Verify the dressing application is correct, the tubing is connected, the Dressing Suction Tube clamp is open and the Dressing Irrigation Tube clamp is closed. 3. Place the therapy unit in an upright position as level with the wound as possible. The device can be placed on a table, hung from a foot board or attached to an I.V. pole using the I.V. Pole/Bed Hanger adapter. 4. Hang irrigation bag on the I.V. pole at a level that is higher than the level of the wound. 5. Press the ON button. All LED indicators will illuminate for 1 second during the power-on self-test, after which, the ON button will steadily light green. 6. Dressing should collapse indicating the presence of vacuum. Once dressing integrity is verified, open the Dressing Irrigation Tube and adjust drip to a rate appropriate for desired therapy. 7. Carefully check dressing for vacuum or fluid leaks and repair with additional Polyurethane drape material as needed. 8. 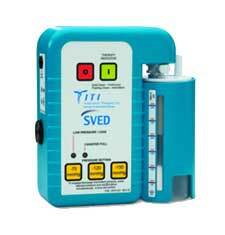 The SVED® Wound Treatment System should be operated at least 22 hours out of every 24 hour period. Remove the Svamp® Dressing if therapy is terminated or is off for more than 2 hours in a 24 hour period.